According to current data, almost 50% of the UK adult population are dog owners, so it is no surprise that our nation of dog-lovers are keen to include their beloved pets when planning a holiday. As well as being a full-time dog behaviourist, I am also a dad to Katie, and together with my partner Sara, we have enjoyed and been firm advocates of holidaying as a family with our dogs for many years within the UK. There are many advantages of taking your dog on holiday with you such as the joy of spending time with each other without the day-to-day pressures of normal life, the bond you develop and the memories you create together. You also save on the cost of kennels or pet sitters and lose the stress of leaving your dog behind, being looked after by someone else. Most of our breaks are coastal, exploring Cornwall and Devon extensively as we live in land-locked Worcestershire. We’ve also enjoyed travelling to the Channel Islands with all of our dogs and this makes a great location for dog-friendly holidays. Holidaying with your dogs is great fun, but can bring fresh challenges although these can be overcome with a little research, planning and preparation. The following advice is aimed at providing a number of tips to ensure that you and your dog really enjoy your holiday and you return home with your head held high with your dog being an ambassador for the canine community. Before going away with your dog, there are a few things to consider when it comes to booking your trip. Wherever you decide to take your dog, he will need some familiar items such as his bed, blankets or any towels he may be used to. Not only will this mean you are prepared, just in case your destination venue doesn’t have any dog-appropriate bedding etc but it will also help keep your dog calm and less anxious in a new environment, as he will be comforted and relaxed with belongings that he recognises. His favourite toys are also a great way to keep your dog calm and distracted should they become anxious or nervous when travelling somewhere new. Pack the same food that you would normally feed your dog, taking adequate supplies. It is vital to take a plentiful supply of water for your dog when travelling even if you are taking public transport. Think about the equipment you are likely to need during the holiday including a grooming kit, towel, leads, toys and chews, leads and a plentiful supply of poo bags. A first aid kit for dogs is a really good idea. Before you embark on a holiday with your dog, any health niggles should be resolved with a trip to your vets. It is also important to consider your dog’s safety when exploring new locations. Although microchipping your dog is now a legal requirement, not everyone complies with this, so I do recommend having them chipped before going away somewhere new and ensure you have a visible name tag and a contact number for their collar, for added security should they go missing. With many of our beautiful beaches being dog-friendly, as well as pubs, cafes and even numerous restaurants welcoming our four-legged friends, it is no wonder even more of us are choosing to take our dogs on holiday around the UK. When choosing a location for a break away with your dog, consider his needs too. Is he confident in water; does your dog feel stressed in busier and more crowded town situations; will he be reliable around livestock? Consider the time of year; will there be restrictions on beaches, foals/ lambs being born, health hazards such as ticks in the height of summer or school holidays and crowds to think about. As you know your dog best, it is worth considering these factors when choosing a destination and time to travel. Once you have chosen a location and good time to travel, searching for dog-friendly accommodation can prove a little tricky, as many hotels, bed and breakfast establishments and self-catering accommodation have restrictions when it comes to allowing man’s best friend to stay. Most accommodation will signpost on the internet or marketing material whether they accept dogs and doing your research in advance will be rewarding to get the best place for you to stay. Check the facilities available for your dog and the area available outside and whether it is secure. The limit to dog-friendly space means that booking in advance is usually recommended. Due consideration for the specific rules for your accommodation should be taken into account. Adhere to toileting area rules, where your dog is going to sleep and ensure that your dog does not cause a nuisance to other residents. Make sure that you are aware of local vet details in advance of your stay. If your dog is used to being in a crate, this can be a good way to contain your dog for sensible periods in the day, or whilst sleeping at night. Crates can also help avoid the destruction of other people’s property and ensure peace of mind for you as the owner. Consider the individual needs of your dog when choosing holiday accommodation. If your dog is prone to be vocal, consider when staying on a camp or caravan site to try to pre-book a quieter pitch away from a place where people will regularly pass by and maybe near to the dog toileting and exercise area for your convenience. It’s important that your dog is not given the opportunity to become protective of your location. The use of an appropriate fixing point such as a long line (10-15’ should be adequate) to keep your dog contained within a specific area, a comfortable place to rest and a chew or toy to keep them busy should minimise the opportunity to be vocal towards passers-by. Provide shade and water, especially if hot. Placing the dog behind a windbreak may help if he is prone to constantly bark at people or other dogs passing your area. If you know your dog is an excessive barker, then you would be advised to look at ways of addressing this behaviour in advance of your visit. Take a look at this article here, which addresses this very subject in some detail. In the final stages of packing, avoid heightened levels of anxiety by splitting responsibilities across the home. Ideally, one person can exercise the dogs, whilst the other completes the final stages of packing. Dogs can find such disruption stressful and moderate exercise is an excellent preparation prior to a journey. Your dog should be familiar and happy with your chosen method of travel prior to the holiday. If you know that your dog finds it stressful, then seek to remedy this well before your travel date. This article on car travel problems with dogs takes an in-depth look at the problems you might experience and how to resolve them. Avoid feeding him close to the time of travel to avoid sickness and if you have fed them a meal to keep to their routine then reduce the quantity provided. Exercise your dog to make sure that he is physically tired and mentally relaxed. Ensure that his travel space is sufficient for him to get up and turn around and that it is secure from loose items that may otherwise fall on your dog during the journey. A comfortable temperature with familiar bedding will also help during travel. Be sure to provide adequate supplies of fresh water (we have used this travel water bowl for many years now and find it ideal) and to factor in toilet breaks along the way. If you choose car travel consider the safety of your dog whilst in transit by using a luggage guard, travel crate or harness. Make sure that he can get in and out of the car easily and also consider shades on car windows as they can quickly heat up should the English sunshine! On arrival at your accommodation, make sure that your dog has an opportunity to let off steam and release some energy before you focus on unpacking and setting up caravans, tents etc. If travelling to family or friends, I often stop a short distance away from the destination to allow the dogs a toilet and exercise opportunity, allowing me the freedom to say hello to everyone on arrival without worrying about the dogs! I enjoy the freedom of staying in our caravan with the dogs but regardless of your choice of accommodation, it’s important to acquaint yourself with the rules about staying with your dog. Owners of holiday accommodation are nearly always relaxed about your dog as long as you demonstrate care for their property and regard for their other guests. There are usually guidelines with regard to where your dog is allowed, where they should toilet and how they should be tethered or kept within a certain area outside. Some establishments may specify that your dog must not be left in the accommodation on his own. If you are planning some activities that are not suitable for your dog, you can source a good local dog sitter or kennel facility that offers daycare whilst on holiday. Even if the accommodation allows it; leaving your dog alone for an extended period of time may cause your dog to feel stressed and anxious in an unknown place and this can lead to destructive behaviour. It is very likely that you will encounter a beach, park or town environment where the manners and behaviour of your dog will come under scrutiny. The level of behaviour that your dog demonstrates at home will be the best he can achieve whilst on holiday. Therefore your control with the recall, toileting locations and consideration of other people and dogs must be taken into account whilst you are away. If you have a dog that will recall, understands basic obedience commands and is good with other dogs and people, you can allow them the appropriate levels of flexibility when in public. However, if your dog fails to meet an acceptable standard in one of these three key areas, make sure you restrict his behaviour so that you don’t cause offence or concern towards other people. As a quick tip, the use of a 50’ training line on the open beach is an ideal way to allow plenty of freedom whilst retaining a high degree of control. It is essential to ensure that you always remove any faeces and that you correctly dispose of it. Carry more poo bags than you think you need and keep them in coats, cars, accommodation, everywhere that you go! Nothing is worse than being caught short for a bag! Consider researching the area before you visit beforehand as a number of beaches are closed to dogs during peak season or have restrictions in place such as your dog must be on a lead within certain times of the day. This has caught us out a few times and now we go prepared with a list. You can always find this information on the internet and the local tourist board can be very helpful. There are some safety considerations to be taken into account whilst on holiday with your dog. Always contact a local vet if you are not sure how serious an injury your dog has sustained. A local vet will always support you with advice, even if it is out of their practice hours. A basic first aid kit for dogs, as previously mentioned, can help with lots of minor injuries such as small cuts on feet. A first aid kit for dogs usually contains the following: This one here is a very comprehensive kit available on Amazon and is similar to the one I carry in my car. Sand impaction is when your dog swallows too much sand whilst playing on the beach. This sand can build up in the intestines which can block or irritate the gastrointestinal tract. Symptoms include vomiting and diarrhoea, often containing sand and sometimes you can feel the sand within the dog’s stomach. Sand impaction can be treated but it is not always successful and it is better to prevent the problem and take some precautions on the beach with your dog. If your dog enjoys chasing a ball, try to throw the ball on the wetter sand as the wet sand is less likely to stick to the ball. Don’t throw the ball too much as it is inevitable that over a long period of time, your dog will swallow some of the sand even if it is wet! Like most dogs, our two love playing on the beach and in the water, but excessive exercise in the sea can lead to saltwater poisoning. Mild consumption of salt can cause diarrhoea, but more seriously, significant consumption can cause hypernatremia leading to vomiting, dehydration, seizures and confusion requiring emergency veterinary care. The best course of action is to take preventative measures and avoid salt poisoning by taking a break every 30 minutes away from the water to offer fresh drinking water to the dog and to limit your time on the beach to two hours. If your pet starts to exhibit signs of saltwater poisoning, immediately take them to the vet; treatment will likely include careful administration of IV fluids, electrolyte monitoring, treatment for dehydration and brain swelling and supportive care. Washed up jellyfish may be dead, but they still have the ability to sting for several weeks. There are several types of jellyfish in the UK, including lion’s mane, Portuguese man-o-war and mauve stinger jellyfish. Dogs often like to investigate everything they come across, but if a jellyfish stings your dog, pull any remaining tentacles off with a towel. Do not touch them with your hands or rub the site of the sting with sand. Use sea water to clean the area and contact a vet if you are concerned. Symptoms of concern could include vomiting, swelling, retching, and difficulty in breathing. Inland water can also cause problems for your dog with the production of “blue-green algae”, a group of bacteria called cyanobacteria. This is actually bacteria not algae and is usually found in non-flowing fresh water and is most common in hot weather when there is less rainfall. The bacteria may be present in water without looking obvious, so make sure you take notice of any warning signs. If your dog vomits, has diarrhoea, seizures, lack of consciousness or breathing difficulties after drinking in affected water, contact your vet. There is no antidote for the toxins produced by the bacteria but the vet will make your dog sick and try to flush the toxins from the body. This form of poisoning, if not caught early enough, can cause fatal liver failure. It is easy to over dramatise the potential for danger and the important thing to consider is that water exercise is an excellent activity for dogs and as long as you take sensible precautions, the benefits far outweigh the risks. Woodland, grassland and heath areas are great landscapes for walking as long as, after exercise, you check for ticks on your dog’s skin. Ticks cause disease from bacteria and microbes when they bite your dog. Ticks have eight legs and look like egg-shaped spiders and they are particularly common in areas frequented by sheep and deer. The tick will climb or drop onto your dog usually around their head, neck, ear and feet. If you run your hands over your dog and brush them you will locate any ticks fairly easily. The tick becomes larger and darker as it fills with the blood of its host. As they carry disease, it’s important to remove the tick as soon as possible. You need to twist off a tick, preferably with a tick-removal device (it’s the one we have and can be found on Amazon) to avoid squeezing the body of the tick, which expels the blood back into the dog, increasing the risk of infection. Check your dogs’ feet and ears for grass seeds after walks, and avoid throwing sticks as caught the wrong way, they can cause very nasty injuries. Choose a ball that is the right size, to make sure it can’t get lodged in your dog’s throat and cause suffocation. Avoid leaving your dog in the car in the summer months even for short periods, as even with the windows open, the temperature can easily become much too hot and cause heat stroke or worse. We have travelled with our dogs to the Channel Islands and it is a relatively straightforward process without the need for a pet passport. All dogs over 8 weeks old must be micro-chipped and no vaccinations are officially needed, but your dog should be in good health and it is advised that you seek the advice of your vet before making arrangements. We have taken a car on the ferry and the dogs stay in the car as long as the windows are slightly open and they have access to water. You are allowed to visit your dog whilst in transit if accompanied by a member of staff, although this is dependent on the weather conditions. Car owners are asked to disable their car alarms so that they don’t make a noise when the ferry is in motion which would upset the pets. We checked in early after a quick last minute wee break for the dogs and the ferry employees, responsible for loading you onto the ferry, place you near to stairs for easy access and safer visits to the car whilst in transit. If you are a foot passenger, your dog may travel in an RSPCA approved carrier. Your pet will remain in a dedicated area of the ferry whilst in transit as only certified guide and sensory dogs are allowed in passenger lounges. Dog-friendly accommodation is not plentiful in the Channel Islands, but if you are able to book in advance to secure a good location, out of main season holidays can be lovely and access to the beautiful beaches are at least as good as the mainland if you can avoid the peak season. Taking your dog abroad has been made much more accessible in recent years, with the introduction of pet passports. Your dog will need a valid pet passport, have an implanted microchip, be at least 15 weeks old at the time of travel, be vaccinated against rabies and been treated for tapeworm. A pet passport will document your dog’s essential information such as age, date of birth and their microchip number. The microchip must be implanted before or at the same time as the rabies vaccination. Pet passports are the legal document that allows pets to travel to and from the UK to other countries with their owners. You can arrange your pet passport through your vet and your dog will need to have a blood test before travelling abroad. Your dog can only travel to certain countries with their passport, EU and listed non-EU countries, so before you book your holiday you will need to check the requirements of the destination country ahead of time, as they may need additional blood tests and vaccinations. At the time of publication of this article (December 2018) DEFRA have advised that you will still be able to travel with your pet to Europe after Britain leaves the EU, however you may need to take some additional steps to allow your dog/s to travel in a “no deal” scenario. The best course of action is to contact your vet for the most up to date information as soon as you can to allow sufficient preparation for travel. Ferries have different rules and regulations for travel with dogs, but in addition to the appropriate documentation, may include the wearing of a muzzle in public areas, approved pet carrier with bedding and water, checking in an hour before departure, and your dog being clearly fit for travel. As holidaying with dogs is becoming increasingly popular, booking in advance is advised. I realise that this has been a whistle-stop tour of holidaying with your dog. More detailed and specific information is available on the internet and I recommend that you research all the requirements for your dog to travel prior to your departure, particularly with regard to vaccines and documentation if travelling abroad, to ensure everything is put in place for a successful trip. 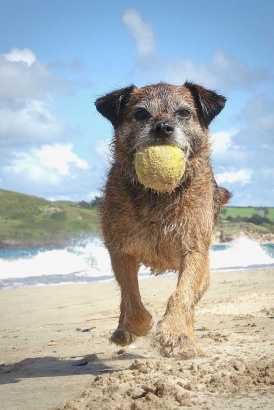 We have loved taking our dogs on holiday with us and any cost, effort in planning or restriction in places available has been more than compensated by the laughter when watching even your very old border terrier, race around a beach in excited circuits and yipping for joy! I have carefully selected this list of items for when you travel with your dog and it can be found here at Amazon.